Among all the Japanese Maples, Inaba-shidare is one of the best and most visually stunning. Compact enough for any garden, it is and covered with gorgeous red, lacy leaves that cascade down from its upright-growing trunk. 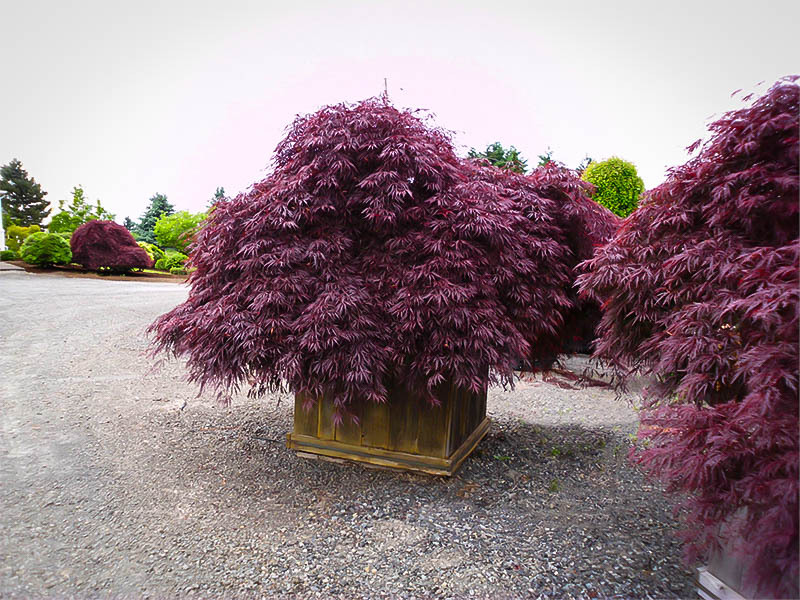 New foliage comes in the spring as a deep reddish-purple that can appear almost black. Throughout spring and summer the leaves undergo changes into a much more vivid red color, and finally in autumn burst into a bright fiery crimson. Inaba-shidare is a vigorously growing shrub that can reach its full height and width within ten to 15 years. This fast rate of growth will help it establish itself in your landscape design much faster than many similar varieties, and it will then bring you years of absolute visual delight. Shrubs don’t have to be a boring addition to your garden space. In fact, we use shrubs in a variety of ways in all kinds of different landscape designs. They are one of the most versatile plants we could choose to incorporate into our outdoor spaces; they can become tall and dense privacy hedges or low informal separators from your friendly neighbor’s property. Shrubs also make great foundation plants around your home or any other building that might need a little bit of greenery around it to spruce it up. Shrubs, especially ones like the Inaba Shidare, can also be used as a single specimen as a central focal point in your yard. 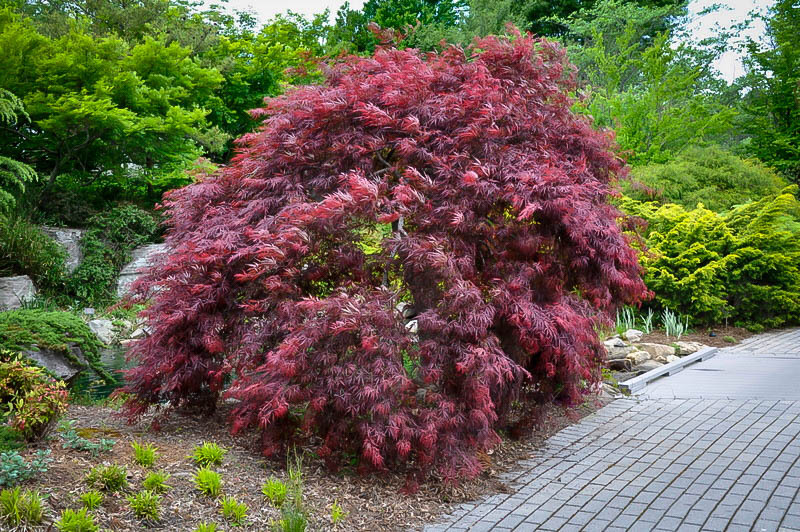 Growing to roughly ten feet tall with a crown of 15 feet in diameter at maturity, the Inaba Shidare Japanese Maple is a perfect choice for gardens that have a large space that needs to be filled. The leaves of the Inaba Shidare are of the red lace type; instead of being solid palmate shaped leaves they have seven to nine points that are separated at the base and appear almost lace-like or feathery. 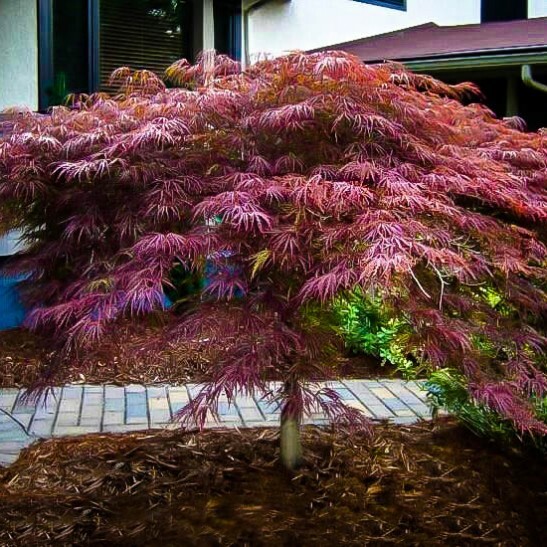 Unlike other Japanese Maples, whose new foliage appears in the spring as a light green color, Inaba Shidare produces deep red, almost purple foliage that turns into a deep red over the summer and then to a final brighter shade in the fall. Inaba Shidare is cold hardy to USDA plant hardiness zone 5 and is suitable for locations into zone 9. In colder locations like Iowa and Illinois, young shrubs will require some sort of protection against the elements the first year or two until they are well established. Usually an insulated burlap cover throughout the winter months will protect barren branches, and it would be beneficial to keep the shrub covered into the spring to guard against a late frost. This shrub can tolerate chalky, alkaline soils but prefers slightly acidic soils with adequate moisture and good drainage. In hotter locations that may be prone to long periods without rainfall, it will be important to adopt a regular watering schedule to ensure the roots do not dry out. Young Inaba Shidare will love to soak up the sun, especially the cooler morning sunlight light in warmer areas. They are best situated where they will get some filtered shade from the hotter afternoon sun and, because of their low height, will make an excellent transitional shrub between taller trees and lower ground growing plants. As the Maple matures it will be able to tolerate more sunlight and the results from this are most attractive. 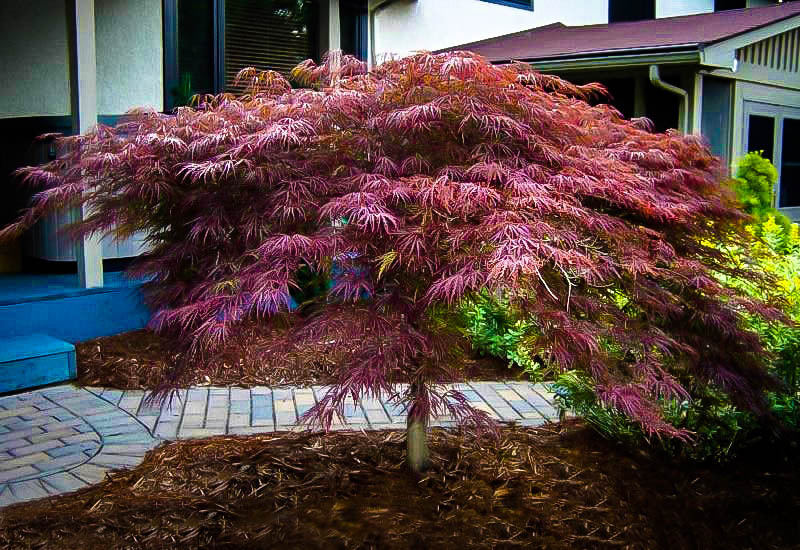 Japanese Maples tend to produce the best colors when they receive slightly more sunlight than average. Like many other Japanese Maples, pruning is largely unnecessary for this variety. However, because it is smaller and wider than most tree forms of Maples, you may want to prune for cosmetic purposes. Removal of any dead or dying branches as the base will also ensure that the tree is not bogged down with dead patches and will encourage new growth in the spring. As with all Maple trees that produce sap it is best to perform any kind of pruning late in the autumn to mid-winter months to avoid excessive bleeding. Fertilization is also beneficial every six to eight weeks during the spring and summer months in order to aid growth and color production. The shrub is also free from any serious disease or bug infestation problems but it is best practice to check the leaves and branches periodically, just to ensure you catch any potential issues before they become serious. Acer palmatum didn’t make its debut in Europe until the early 1800s, when a Swedish botanist brought back drawings of the tree which later became synonymous with the exquisite oriental gardens of the tree’s native lands in China, Japan and Korea. Since then the tree’s popularity has resulted in it being imported to the United States and many other countries around the world. For centuries, horticulturalists in Japan have been tinkering with the Japanese Maple to create over 1,000 unique variants of its parent tree. Inaba Shidare is a weeping or pendulous variant of the Japanese Maple, that stays relatively small in comparison to other cultivars. When you mention a Maple tree to someone, they almost always picture the towering wide crowned parent Acer palmatum and not the smaller varieties like the Inaba Shidare. Incorporating this shrub into your property’s landscape design will not only provide an interesting and unique visual aspect, but you will also be helping the environment and increasing your home’s value. Inaba Shidare is one of the best choices for spectacular color production if you aren’t looking for a flowering shrub. Line your property with them, plant them in a container, or use it as a single specimen to create a central focal point. However you choose to utilize this shrub, it is not going to disappoint for many years to come.